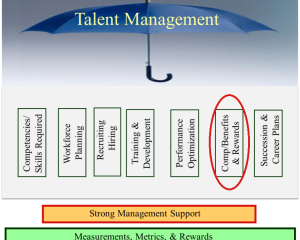 In the Group50’s series of Talent Management Blogs, we defined “Talent Management” as a set of integrated organizational HR processes designed to attract, develop, motivate, and retain productive, engaged employees. Hypothetically, we have created the job requirements, determined that we need someone to fill a role, recruited and hired a great new employee, provided the training required to be successful, set standards and expectations and provided the feedback such that they can continue to improve their performance. Now it’s time to think determine how the employee should be compensated and rewarded. I typically split this discussion into two sections; Rewards (Money, stocks, benefits, bonus, etc.) and Recognition (Thank you notes, On-the-Spot, Appreciation, etc.) In the near future, I will post several blogs on the different Reward/Recognition methods and how the different generations perceive and respond to each. This blog is focused on strategy and outcomes one must consider. The basic premise (outcome) of an employee recognition program is to recognize and reward work and behaviors that further the desired business results. This should be easy at this stage in a Talent Management program as you have already determined the goals/measures you are seeking, provided the training, and have developed the Performance Management systems to identify the expected results. Pay too low and your best employees will walk. Pay too high and it puts an undue strain on the overall corporate financial health. Who is your competitor for talent? Where are they positioned? Is your industry growing or shrinking? Are the required skills specialized/sophisticated? Is the local economy growing or shrinking? Is the required talent Plentiful or Shrinking? Perquisites: Cars, Meals, Clothing, Facilities, etc. Above all else, your Compensation strategy must be communicated, easy to understand consistent and equitable. After all, the Compensation/Benefits program is one of the key drivers for employee performance and engagement. As you can see, this is a very complex part of your business and talent management requires a specialized set of skills to manage it to deliver all of the needs listed above. If your company does not have the in-house expertise, search out and hire a Compensation/Benefits consultant to guy you through this important area of your overall Corporate Strategy. If you want to learn more about how Group50 delivers an outstanding Compensation and Benefits Strategy, check out our Assessment and Workshop. 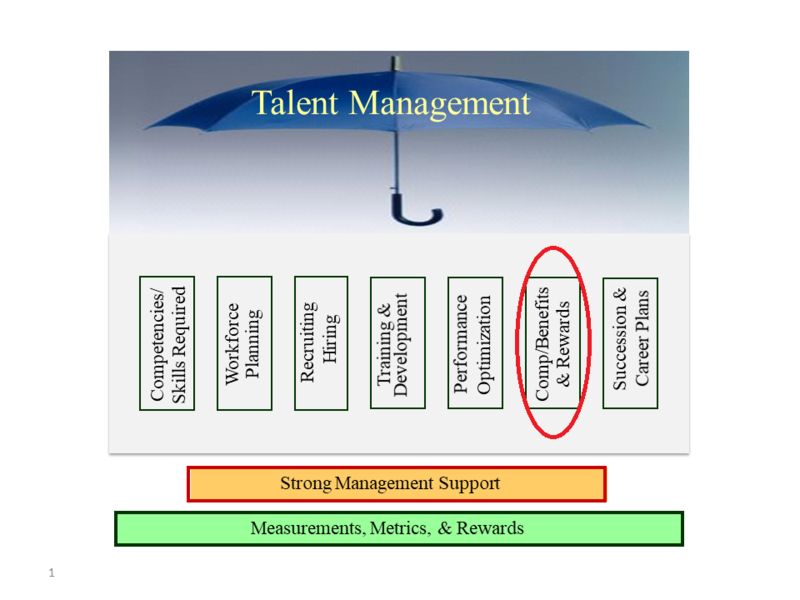 Now that you have hired the best employee, provided training and defined optimal performance and are holding people accountable to those standards and are now rewarding this great performance; it’s time to discuss the Succession and Career Planning portion of the Talent Management model. This will be the focus of the next blog. Click on the following link to complete this simple HR Self-assessment. The free self-assessment takes only a few minutes and your results will be sent to you immediately along with information on how your company stacks up against benchmarked best practices. About the author: Bruce Dougan is the head of Group50’s Organization Design and Development Practice. Bruce and the Group50 team are all former executives with well-known manufacturing and distribution companies who understand what it takes to design, train, develop and motivate organizations to successfully implement a company’s strategic plan. Group50 has designed a series of strategic assessments, workshops and strategic execution tools that optimize your organization. You can reach us at (909) 949-9083 or send a note to info@group50.com.